Glór na nGael Chairman, Pat Carey and radio presenter Áine Ní Churráin were present in Glasson House Hotel in Westmeath last Saturday night to present the annual Glór na nGael awards. 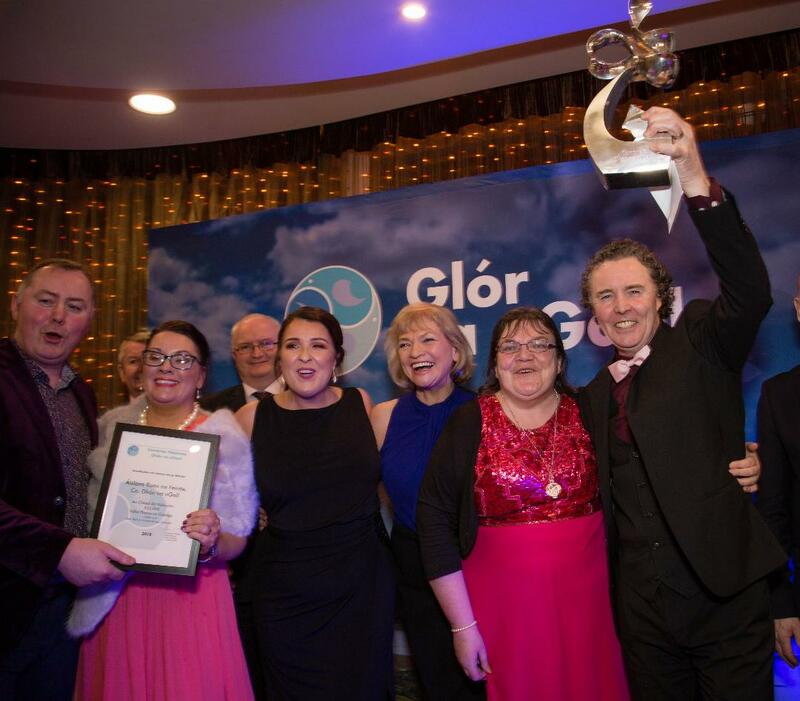 Aoidh Mac Ruairí and his colleagues from Áislann Rann na Feirste accepting the overall Glór na nGael Award - The Glór na nGael Trophy and a cheque for €20,000 in the company of Aodhán Mac Cormaic, Roinn Cultúir, Oidhreachta & Gaeltachta,Pat Carey, Cathaoirleach Bord Stiúrtha Ghlór na nGael and presenter Áine Ní Churráin. A prize fund totaling €80,000 was awarded to Irish Language community groups and 3rd level societies in recognition of their achievements in Language promotion and revival. Coiste Forbartha Chnoc Fola received the Duais Chomhairle Chontae Dhún na nGall award with €1,500 and the New Entry Award, €1,500. A Special Recognition Award was presented to Ionad Naomh Pádraig, and Líonra Leitir Ceanainn was bestowed the Ulster Voluntary Group Award and a cheque for €1,500. Pat Carey asked the guests at the ceremony to stand for a minute's silence in memory of the four young men from the Donegal Gaeltacht who were tragically killed in a recent road traffic collision. His thoughts went out to the bereaved families and friends.